When the Ursuline Sisters of Chatham decided in 2003 to sell their Motherhouse and build a new and smaller home, they undertook a long and interesting journey that involved all of the 136 Sisters living at that time. They wanted a building that would be suitable for senior Sisters, cost efficient and above all environmentally friendly. They had been very active for many years in promoting ecologically responsible living by recycling, re-using, composting and using “green” housekeeping products. Efficient use of energy and water and indeed of all earth’s resources had been a priority for several decades. Because the Sisters had historically always had extra land, there had been a deep appreciation for green space and they had nourished beautiful gardens and useful crops. With this background in mind, when they approached the exciting and challenging task of building a new home “from scratch”, there was considerable trepidation. Nevertheless, with great courage, insight, research, advice and an amazing amount of just plain hard work on the part of all concerned, the Sisters moved into a beautiful new home in November 2006. The journey from beginning to end was difficult, challenging and exciting. It was also a wonderful learning experience and a source of profound relief, pride and satisfaction. Now that it is complete, the Sisters are looking back over the project to reflect on the lessons learned. They want to evaluate the actual results of the creative and innovative methods and technologies used in planning and building a “green” home. They took some costly and sometimes risky steps to accomplish the hopes and dreams of over 100 women of faith and conviction. There is also the hope that the educational value will be of assistance to others as the country and the world address the current situation of the wasteful and destructive use of resources in an expanding society. What is presented here is a description of the process the Ursuline Sisters chose to plan, design and carry out this somewhat daunting but always exhilarating adventure. The whole process began modestly with a small group of Sisters with varying professional backgrounds who were asked by Community Leadership to poll all the Sisters to ascertain their future living needs. At the same time the General Leadership of the Community and the Leadership Team of the Motherhouse were busy studying, evaluating and gathering facts about the Motherhouse. In 2001, at the Chapter (a gathering of all the Sisters which takes place every four years), discussion centred around the options open to the Sisters in view of the information gathered by these three groups. The possibilities included renovating the Motherhouse; doing nothing except necessary repairs and changes; building new on the same site; or starting fresh with a new building on a new site. The old Motherhouse was too large for its declining population and some of the sisters had “spread out” to use several rooms apiece. Heating, lighting and cleaning costs were becoming prohibitive. The Infirmary for the Sisters who were in need of full time care was located on the third floor and so was a source of constant concern about safety. The Chapel was very beautiful but long term engineering problems made it a recurring expense. It was also much too large because it was built for 400 and on most days was used by about 50-60. Maintenance was a constant drain. The Chapter recommended that the community be proactive and address the situation head on. One of the first steps was the formation of The Pathway Committee. This committee made recommendations to the General Leadership, in particular, that an architect be hired to estimate costs of renovating the present building and/or building a new one. When the community gathered to receive this information and talk together, the direction was very clear – build on a new site! A new group, The Co-ordinating Circle for the Motherhouse Project (CCMP), was set up and the process of building a new home was underway. This is a bare skeleton of the first steps and it does not convey the excitement, the struggles and the lessons learned. The Pathway Committee was the vehicle for each sister to put forward her needs and dreams. Together all prayed the Pathway Prayer, filled the Dream box with suggestions, and read the Pathway bulletins where new possibilities were considered. Displays were presented in a Pathway Center in the Motherhouse. Celebrated in the displays were the former motherhouses that had been loved and passed on through the years of history since 1860. Within a year and a half the Committee was clear on the wishes of the community. Even the shape of a new building was growing clear. From area meetings, correspondence and newsletters some of the hopes for the new building were emerging. Sisters would appreciate a private bedroom with a private bath, generous closet space, connections for cable, internet service and telephones with answering machines. However there was a constant recurring theme –make it simple–make it beautiful. The architect engaged for the project was Peter Cook of Jorden & Cook in Chatham. He and his associate Terra Kitzul met frequently with the CCMP. Together they developed guidelines for the new home. The creation of a house with a warm and “homey” atmosphere and with a variety of spaces that encourage relational interaction on several levels. This principle is evident in the Kiva (the gathering space), the dining room, the solarium, large and small visiting spaces, quiet prayer areas and private residential areas. Aesthetics that connected the inner and outer spaces and made maximum use of daylight. Saving space by creating multi purpose areas that provided for worship space, large meeting possibilities and public events. Easy access, handicapped access, short halls and indoor “parking” spaces for walkers, scooters, etc. were suggested. Particular attention of course was given to the eco-friendly requirements necessary to achieve a LEED gold standard (LEED© – Leadership in Energy and Environmental Design). An enclosed garden area attached to the health care area and a generous green space outdoors for walking, reflection and social exchange. Adequate parking available on site and outdoor lighting to ensure safety and security without being intrusive to the neighbouring community. The Co-ordinating Circle for the Motherhouse Project (CCMP) was made up of sisters who had some expertise, or at least an interest, in design or finance. This committee formed working groups – design, real estate, heritage and eventually a transition team. A newsletter kept the community up to date as the project developed. Buying the property was one of the first big moves. The Sisters wanted to be part of a neighbourhood. They wanted to construct a building that would not become too large in 15-20 years. The entire project was budgeted and a 10 year plan was drawn up so that a decision could be made about what was available for building while still maintaining community life. The budget was presented to assembled groups of sisters, and when the cost of the project needed to be adjusted upwards twice, both adjustments were shared with the community. Regular reports of the progress of the building and its cost were circulated. The Real Estate Committee struggled for almost two years. The purchase of land had to move in tandem with the sale of the Motherhouse. It all took time. Eventually a suitable buyer was located – our Motherhouse was to be renovated and operated as a senior citizen home by a Christian group that planned to keep the chapel and use it. Sisters planned special rituals to assist the process of leaving a treasured home and moving to a new one. New land was purchased. From the very early discussions of the hopes for a new home the Sisters wanted something “simple”, “homey”, “beautiful” and “Earth friendly”. As early as the chapter of 1989 there had been a sense of responsibility to Earth. The Pathway Committee had invited the community to study and absorb a new awareness of the magnificence and uniqueness of Earth as it impacted life and community. The image of our planet seen from space, a blue marble swirled around with white clouds, promotes the realization of how fragile but tough life is. As the Chatham Ursulines reflected together, they came to accept the moral imperative to act in favour of care, protection and restoration of Earth. They asked themselves if their actions contributed to a sustainable Earth Community. Their effort to keep this question alive is epitomized in the stained glass windows that were commissioned for the Kiva, the gathering space. In these times, explorations in science and technology have provided new insights into the origins and place of the human community in the unfolding story of the universe. 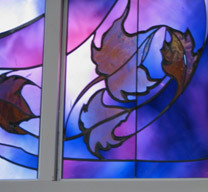 “The Art Glass begins with the East windows symbolic of beginning, of the morning. Deep purple to violet, the primordial beginning of the universe is pierced with a red to orange flash symbolizing the “big bang”. Out of this explosion formed the primal elements evolving first into wave and water, then into hills and streams, mountains and volcanoes. With each new life form the earth grows more diverse. A long horizontal “cloud” or “wing” of white on clear streaky glass reveals a night sky with millions of stars, perhaps “stardust”. Below this sky rises the “compassionate curvature of the universe”, a deep translucent blue with a halo of 24 karat gold luster emanating from its surface symbolizing the holiness of the universe. Moving towards the West, a horizontal cloud or wind again separates the sky and “universe” from the lavender to purple “fields” and maple leaves. The former location of the Ursuline Sisters provided 127,219 sq. ft. and the new location 55,865 sq. ft. (44% of the previous building). It is interesting to note that this building with sleeping accommodation for 50 Sisters is too small at this point. It was purposely built small since numbers are decreasing. To tide them over the interim period of an estimated 10-15 years, the Sisters built 4 townhouses, 8 units accommodating 2 Sisters per unit. These are in the front of the property and are separately registered for easy sale when they are no longer needed. The additional floor space amounted to 12,000 sq. ft. Thus the new location is half the space of the former Motherhouse, even with the townhouses considered. This floor space reduction of 50% made possible a matching reduction of lighting, heating, space cooling, and water heating, reducing energy demand by 51%. Over the years, the Sisters had sold off pieces of property so that our original holdings, though still considerable, were much reduced. At the time of sale, the old property measured 5.93 acres. When the new property was purchased, the area was just 5.18 acres. The building’s footprint is 40,030 sq. ft. with associated hard surfaces of 53,270 sq. ft. and 67,600 sq. ft. dedicated to green space. The remaining space was allotted to the townhouses. So the final distribution was building footprint 25%, hard surfaces 33% and green space 42%. One of southwestern Ontario’s environmental challenges is the loss of native Carolinian forest habitat. Chatham is located in a very unique part of the country. Canada is divided into 15 ecozones and Chatham is the Mixed Wood Plains zone. This zone includes the lower Great Lakes–St. Lawrence River valley. Within this zone is an eco-region characterized by distinctive ecological features called Lake Erie Lowlands or Carolinian region. This region, the southernmost part of Canada, is rich in rare and unusual plants. The green space at Villa Angela corresponds to this region in the choice of native or adaptive vegetation. A recent community celebration was marked with the planting of a honey locust tree. Horticultural modifications of native species such as pink dogwood, yews, spruce and cedar are also found in the green areas as well as non-native but adapted species. The lawns are seeded with a mixture of Kentucky Bluegrass (40%), Red Fescue (40%) and Ryegrass (20%) which are native grasses. These native grasses will require little or no additional watering, no chemical fertilizers and no pesticides. The use of drought-resistant native and adaptive plants helps to address the second environmental challenge of southwestern Ontario, that of over-use of water resources. When trees and natural surfaces are replaced with asphalt and buildings, urban heat islands are produced. These artificial, often dark, surfaces store and intensify the sun’s energy. The higher temperatures speed up the chemical reaction that produces smog which has a negative effect on the air quality. This in turn increases respiratory problems, health costs and it also reduces our quality of life. To decrease the absorption of heat caused by hard surfaces (urban heat island effect), the asphalt that was poured at the new site was recycled asphalt which is dark grey with no added black top. The flat roof over the administration area is a white membrane which reflects the heat, and white reflective concrete has been used on the sidewalks. The large island of grass in the front entrance driveway helps to reduce heat. As trees mature they will shade the buildings, reducing heating and cooling needs, and improving local air quality. The transpiration that trees carry out reduces the heat stored in the heat island effect. The new building is a combination of one floor and two floors so that the vertical exposure is reduced, lessening the absorption of heat. High performance windows with a special low emissivity coating (low-e coating), and a fill of inert argon gas in the space between the glass layers, provide natural daylight for almost all regularly occupied spaces, with views of the outdoors. The new building was seen as a concrete way to adopt sustainable, energy efficient practices. The Pathway Committee had begun to learn about environmental building methods. Very significant at that early stage was a visit to the IHM sisters in Monroe, Michigan who were renovating their motherhouse in an environmental fashion, in keeping with their belief that the health and sustainability of planet Earth is today’s necessity. Sustainability, the careful use of the earth’s dwindling resources is becoming the overarching concept of their community in the 21st century. The 650 member religious order has embarked on the largest environmental sustainability project in the United States. The Pathway Committee saw first hand energy efficient resources such as heat pumps and grey water usage. The committee began to study these innovations and used the newsletter to share what they were learning with the community. A sense of responsibility for our world involves a conscious reduction of our footprint on Earth and a determination to limit the use of energy, water and other non-renewable resources. In order to design a building that uses every avenue available to minimize use of non-renewable resources, to maximize use of natural light and renewable energy sources, the Ursulines reached out for assistance to the LEED group – Leadership in Energy and Environmental Design. LEED ranks buildings according to a code and design standards – certified, silver, gold and platinum. The Sisters were guided to a partnership with LEED by Enermodal Engineering of Kitchener. As of October 2008 there are 140 LEED certified buildings in Canada, 40 of these are in Ontario with the majority clustered in the Toronto – Cambridge area. 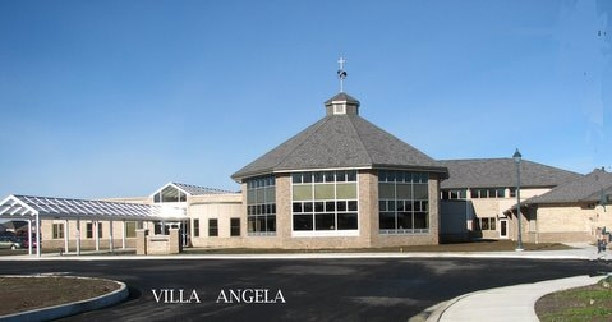 Villa Angela and the Motherhouse of the London Sisters of St. Joseph are the only LEED buildings in the London-Windsor area of Southwestern Ontario. 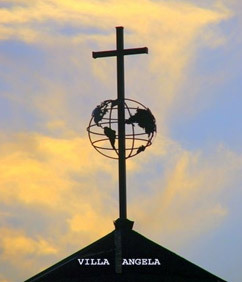 Villa Angela has been awarded the highest possible rating for the size of our building, gold, and this makes it important as a teaching tool. The green building features of Villa Angela demonstrate that building technologies and construction processes can be part of the solution to many of the environmental challenges facing society. Environmental sustainability has also resulted in a building that is a very healthy place to live as well as being functional and beautiful. What could be recycled from the former building was carefully considered. The furniture in the new home is a charming blend of old treasures and a small number of new purchases. The new purchases were selected as certified environmentally friendly with recycled content or Forest Stewardship certification. Stained glass windows of historical value to the Sisters like the stained glass windows of Angela and Ursula from the first chapel are hung in halls, some lovely doors with beveled glass and beautiful wood have a new life. The statue of St. Angela designed by the same architect who designed the beautiful windows in the former chapel is now outside the Health Care dining room on a patio and the statue of St. Joseph, our historic protector, erected in front of the original Motherhouse, has made its final journey to come to rest at the front of Villa Angela. The Bell from the first chapel hangs in a special support near one of the paths in the backyard. The marble St. Angela statue from the front hall graces the entrance to the Kiva. Since the new home is smaller than the former one, some beloved treasures could not come with us. Great effort was made to share these. 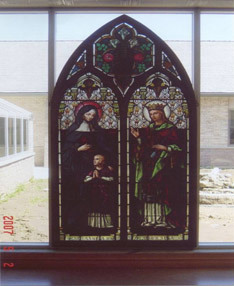 Schools, such as St. Angela Merici and St. Ursula in Brampton, St. Anne’s Secondary School, Essex County, Good Shepherd, Thamesville, and churches such as St. Ursula’s, Chatham, have given new homes to statues. The large statue of St. Thérèse went all the way to All Saints Church, Chicago due to the energy and devotion of an Ursuline graduate. Special recipients of historical items were the Chatham-Kent Museum and the Black History Museum and some furniture went to the newly established Miles Miracle Mission CANcer Assist in Chatham. A series of yard sales, visits from alumnae and family, and dealings with auction houses reduced the Sisters’ holdings in keeping with the desire to reduce, reuse and recycle. Building products were selected for recycled and regional value. An exciting example is the roof shingles called Enviroshake which are made of 98% recycled tires, industrial plastic and fiber with a 50 year warranty. The shingles replicate the look of an antique cedar shake roof but require no maintenance and are made here in Chatham in a state of the art production facility. Carpeting is reduced to a minimum and flooring features Tarkett, a linoleum which is made from rapidly renewable resources – wood, cork, flour, limestone and linseed oil. As well as being environmentally friendly this linoleum is appreciated for its comfort underfoot, durability and beauty and ease of maintenance with reduced use of water and detergent. A LEED certification of gold required that attention be paid to resource reuse and recycled contents as well as the use of regional materials. The shelving units from the former library transferred easily to areas of the new home such as the archives. Materials with high recycled content include insulation, ceiling tiles, wood doors, gypsum board, wheat board and concrete. 20% of the building materials were recycled. LEED granted credits for these recycling efforts. Locally produced materials include asphalt, insulation, masonry and landscaping products. Twenty-five percent of the materials used in the building were manufactured regionally. The credits received in these areas represent tangibly a commitment to the LEED process, since documentation for the total cost of the material and letters from the manufacturers were required to be filed with each submission, representing hours and hours of research and communication! A much appreciated characteristic of Villa Angela is the air quality. Adhesives, sealants, paints, coatings used in the building were chosen for low-emitting properties, reducing the off gasing of chemical odors which are a problem for allergy and asthma sufferers. A Green Housekeeping Program uses low emitting cleaning products, thus ensuring that cleaning products and processes do not pollute the inside air or the exterior environment. All wood products are urea formaldehyde free. Frequent air change and operable windows allow for ventilation and there is permanent monitoring of temperature and humidity with individual environmental controls in all occupied rooms. Villa Angela, with its grounds, is a smoke free facility. 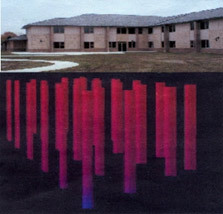 Another conservation concept is that of heat recovery through energy recovering vents. Heat produced is circulated through air handling units as a filtering system and the recovered heat is returned through ducts to heat water. In addition to minimizing heat loss, the heat generated in the kitchen stoves is collected in an energy recovery unit which cools the kitchen. The gas fired water heater is 97% efficient. Plans did not call for use of solar power or wind since research showed that there is not enough wind in Chatham and the amount of sunlight was not sufficient to bank on it. However, there is a continuing plan, begun several years ago, to use energy efficient light bulbs throughout the house and a light sensor system turns lights on and off as required in halls and offices. Natural lighting is maximized by lots of window space so that natural light is generally available for daytime work. 90% of the rooms have a direct line of vision to the outdoors. The light is enhanced by neutral wall colors – earth tones. One of the first big decisions Sisters made was to go with geothermal heating as a means of reducing the use of non-renewable energies. Geothermal heating also called ground source heating or simply heat pumps, reduces dependency on fossil fuels by making use of the natural heat of the earth and is the basic platform of our environmental building program. There are 27 vertical wells dug 320 feet deep into the ground. A solution of water and antifreeze circulates in the network of pipes, drawing heat from the earth or in summer, offloading heat. The process requires no oil or gas furnace. Pipes are sunk into the ground but the ground above can then be used for the usual purposes – a lawn , a parking lot, a garden. Each room has its own thermostat so a Sister can heat her room as much or as little as she likes. In the summer the process is reversed and coolness is taken from the earth to air condition the building. The initial capital costs of such a system are high and the payback on the investment will take a number of years but the choice was basic and necessary if we wanted to literally “put our money where our mouth is ” regarding our concerns for the environment. Since the initial installation period with its glitches has now passed, it is time to analyze this decision. What was the cost? Since the new building differs markedly from the former motherhouse, comparisons and cost studies between these two locations would be similar to comparing the proverbial oranges and apples. When the Sisters made application for a government grant for an energy saving building, plans were compared to a simulated building of the same size but with only the minimum energy saving features expected of all buildings. The Ursuline building was assessed to be 51% more energy efficient. This result allowed a grant of $60,000.00 from the federal government’s Commercial Building Incentive Program. These simulated figures can provide some basis for study of the efficiency of the building with respect to energy consumption and utility cost savings. In the first analysis of the Energy Performance of Villa Angela, produced by Enermodal Engineering which guided us through the environmental features of the building, it is suggested that compared to this baseline building, the energy savings are 43% of the energy costs of the simulated building. If other environmental additions are added to this baseline building and the energy costs calculated, it provides a measure of how efficient the building is. There is room for improvement and future savings as the building, compared to this upgraded baseline building, used 11% more energy than expected. The first year of operation drew heat from the earth that had not been warmed by the heat return from air conditioning the previous summer. A further study of energy used reveals some surprises. The actual gas bill in 2005/06 in the Motherhouse was $141,000. The actual gas bill in 2007/08 in Villa Angela was $17,400. This represents the difference in heating with gas boilers and heating with heat pumps. The actual electricity bill in 2005/06 in the Motherhouse was $64,000. The actual electricity bill in 2007/08 in Villa Angela was $99,600. An overall rough comparison shows a reduction of energy draw and a transfer of the major cost of heating from fossil fuels to electricity, which is a renewable resource. Heat pumps require electricity to condense and distribute the heat. Measures have been taken to reduce the use of electricity in other ways, such as occupancy and daylighting sensors and energy efficient fluorescent lighting. The Sisters have been very effective in reducing the amount of water used in Villa Angela by such measures as dual-flush toilets, ultra-low showerheads, low flow kitchen sinks and low flow lavatory faucets. Very limited irrigation is required for drought resistant native plantings. A 27,200 L (6000 gallon) cistern collects rainwater for non-potable use. Water pumped from the cistern is used to flush toilets and will save over 99% of the drinkable water normally used for toilet flushing. This use of rain water is called grey water technology. From this study some comments about the green building project can be drawn. It was designed and built as a very healthy place to live that is also beautiful, functional and makes careful use of such resources as land, water, energy and other materials. Through the process of building, the Ursulines have become more aware of the fragility of the planet and its decreasing natural resources. They have responded to the call to be part of Earth community. In keeping with the Ursuline traditional roots as educators, this commitment to ecological concepts leads them to share lessons learned and promote environmentally sound living. They have begun to share their green building with various groups such as engineering and architectural students from various Universities and community colleges. The Sisters have hosted events of ecological significance in the gathering space. Notably, Maude Barlow spoke at a public gathering on Canada’s water policies and bottled water. This event was sponsored jointly by the Ursulines, Enviroshake, Royal Bank Financial Group and the Lower Thames Valley Conservation Authority. To live out a desire to build and live lightly on Earth requires more than an initial position – it takes much effort, tons of research, ongoing monitoring, patience and it is expensive. There is a payback for initial investment in technology but it is in terms of years. Being at the forefront of the environmentally sustainable building program has its drawbacks but the Sisters see this as part of their contribution to the challenges facing our society and their ongoing role as educators. The maple leaves and the corn fields in the beautiful Kiva windows remind them that they are part of the ecological community in this part of the universe and it makes them a chapter of The Great Story. What follows is an analysis of the financial return on the geothermal investment Villa Angela 2007 prepared by Sr. Anne Denomy. Note: This analysis uses the figures for the calendar year 2007. This is the first year for which figures are available and represents a first year of operation with its associated problems and adjustments. Figures, though of interest, are not as precise as will be those of the next years. A number of assumptions have been made – these will be indicated and can be tested and modified as future data accumulates. Conventional cost for heating and cooling would have required the same duct work, controls, fans and the like for the distribution system. We would have needed 2 boilers and an air conditioner. The additional price for ground source heating and cooling is the price of the boreholes. A study of the change orders produces $100,000 that may be attributed directly to the heat pumps themselves. Assume some of this expense was included in the original cost estimate and add $50,000 to cost of geothermal. How much of this saving can be attributed to use of Geothermal Heating and Cooling? Assume that the percentage of saving due to Geothermal Heating and Cooling is the percentage of electricity used for the Heating/Cooling. Assume 50% of gas use due to Loop injection and humidification. 13 years is a very approximate period. Since assumptions are conservative, 10 years is a working figure. The second year of operation will give more representative figures and assumptions can be more realistic. However it is of interest to know that our decision to go with geothermal represents an environmental choice as we move from non-renewable gas to renewable electrical energy and a positive financial decision. The Ursuline Sisters take considerable pride in this achievement and treasure their GOLD certification from LEED Canada.